The road will be closed for six weeks. Villagers could face disruption for almost two months while a road is closed to allow trees to be chopped down. A number of beech trees are diseased in the graveyard adjoining Maryculter Trinity Church and need to be felled. 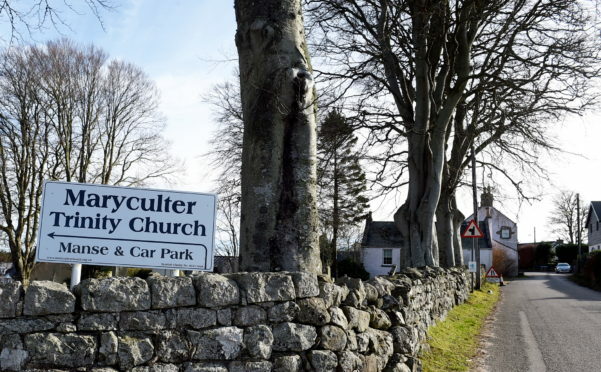 Aberdeenshire Council’s landscaping team will also be carrying out work to cut back vegetation and free up space on either side of the Maryculter road which runs past the church – a site where funeral-goers often park their cars which narrows the space for passing traffic. And the authority will also be taking advantage of the six-week road closure to carry out drainage works. North Kincardine councillor Colin Pike first raised concerns regarding the hazards potentially posed by the trees. He said: “For the safety of the public and the long-term health of the trees, some felling and pruning needs to be carried out. “The closure shouldn’t be the focus as this is for the long-term benefit of everyone and that will be temporary on an ad hoc basis, it’s not going to be shut the entire time. It is believed the trees date back to about 1787, when the current church was built. Four in total will be cut down, with others cut back. A spokesman for the council said: “To make best use of this road closure in order to minimise disruption to road users, in a co-ordinated planned activity, the council’s landscape services team are utilising this road closure to remove vegetation which is encroaching on to the road from the verges. “Also, Friday saw the commencement of arboricultural (tree management) works to the diseased beech trees within the churchyard, which is being carried out by a council approved specialist contractor. “This work will take place over the forthcoming weeks and some further short duration road closures will be required when overhead telephone and electricity lines are made safe to allow the completion of the tree pruning and felling adjacent to the road.